We have already been shooting aerial panoramas for 6 years. During this period of time we shot many interesting cities of the world: New York, Amsterdam, Kuala Lumpur, Sidney, Miami, Las Vegas, Rio de Janeiro, Dubai, Los Angeles and others. However, we didn't succeed in shooting the city we live in, though we did our best. The case is the flights over Moscow are forbidden except those of Russian Federation Ministry of Civil Defense and Emergency Response and Russian police. But this spring we have finally avoid this restriction though it wasn't a usual way. The air parade over Russian capital put a start to all this. In May we could get on board of a helicopter realizing the flight over the city during military parade rehearsal which was dedicated to 55-year Anniversary of Victory in the World War II. 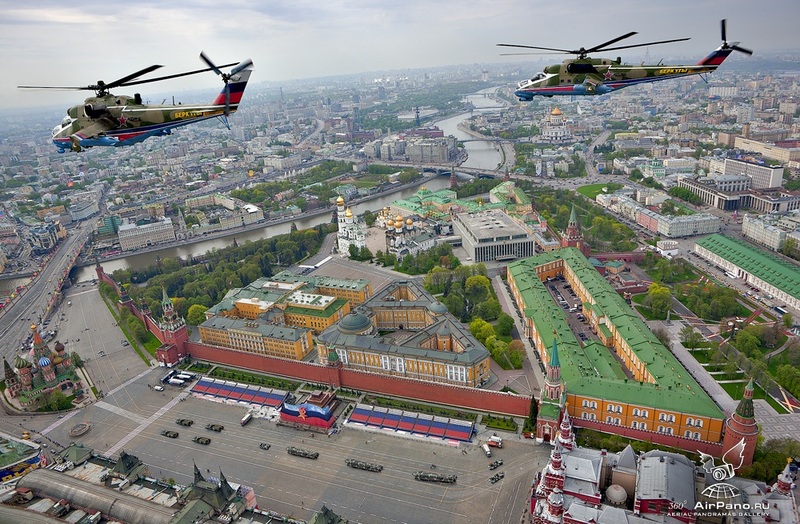 In the frameworks of its rout the helicopter flew over Red Square and we were lucky in a unique shooting of the Kremlin. The technical conditions were very difficult: nobody in the world has ever shot a sphere moving during 5 seconds for one time over the point of shooting with the speed of 250 km/h. Unfortunately, the conditions in the helicopter cabin became even more difficult than I had expected. And right after the takeoff I decided to refuse the spheres' shooting over the Kremlin because of the risk of the shooting's failure. Now, when we have mastered in it, I'm not sure we could realize our plans that time. However, on the way back to the base we could finally make the spherical panoramas from the moving helicopter but it is another story. So, flying over Moscow we decided to make an ordinary shooting. One of the photos shot by Sergey Semenov and where the Golden Eagles go over Red Square was warmly recognized by the viewers and about one month was in tops of the Photosite which is one of the most popular Russian photo resources. I had called him right after that conversation and we agreed about a test shooting which held on the bank of the Yauza River near the Saviour Andronikov Monastery several days later in May 2010. As the shooting methods from a real helicopter and with a model differ, we had elaborated a new method which was successfully realized by Ilya Varlamov (http://zyalt.livejournal.com) who managed the camera. The test showed that spherical panoramas are able to be shot using such method, though more efforts are required in gathering. But the biggest disadvantage in using radio-controlled models is inability to shoot the entire city for 1-2 hours as it is realized from a real helicopter. For this period of time it is able to shoot only one place. After successful tests on the Yauza we mastered the methods of shooting with the helicopter managed by Stas Sedov and we made several panoramas in Ramenki. The third shooting was made in the Southern Port. The camera was managed by Dmitriy Chistoprudov (http://chistoprudov.livejournal.com). The results are represented here. Unfortunately, because of the driving gear's failure the helicopter fell into water and sank in the Moskva River together with the camera and the objective. However, the files were saved. The helicopter itself was raised from the river bottom and in a few months Stas could restore and considerably improve it. So, now we are going to continue the flights. That was the story about the shooting of spherical panoramas in Moscow. Add your review about "Moscow, Gigapixel Panorama"
This is really cool! Thanks. Very good ,lets one see the world. Wi&#281;cej takich pomys&#322;ów duzo jest miast co nie maja panoramy ,Moskwy jest OK.
Oh, what a delight to have an aerial view of a city where I, as a university student had spent 5 years, some 40 years back. Few of the places were honestly forgotten, thanks for bringing back their memory and in particular I liked the idea of labeling them, overall an excellent presentation, cheers. Very nice panorama. What is the name of a song? Dear Erik, the title of the song is Moskva Mayskaya (Moscow in May). Music by D. and D. Pokrass, text by V. Lebedev-Kumatch.